Provide comfort for the family of Jill R. Samperi with a meaningful gesture of sympathy. Jill R. (Dezi) Samperi, 50, of Plainville, CT loving and devoted mother died unexpectedly Friday, January 18, 2019 at the Hospital of Central CT @ New Britain General. Jill was born on January 29, 1968 in Hartford, CT and was the daughter of Robert T. and Joyce L. (Coleman) Dezi of Middletown, CT. Jill was an employee of The Hartford for the past twenty-three years. 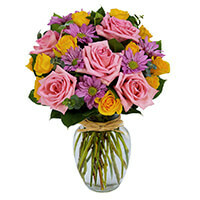 To send flowers in memory of Jill R. Samperi (Dezi), please visit our Heartfelt Sympathies Store. We encourage you to share your most beloved memories of Jill R. here, so that the family and other loved ones can always see it. You can upload cherished photographs, or share your favorite stories, and can even comment on those shared by others. Ralph Aconfora sent flowers to the family of Jill R. Samperi (Dezi). I am sorry the loss of such a young life. It is my hope that the words at Psalms 62:8 bring the family and friends comfort during this difficult time. I met Jill by the pool at Norton Park in the summer when our kids were swimming. We were new to Plainville and Jill was so warm and welcoming to our family. I'll always remember Jill's beautiful smile and laugh. She was so proud of her children and loved being a mother. I'm so sorry for your loss and hope that you find some comfort and support in knowing that you are in our thoughts and prayers. With deepest sympathy, love Ralph and the entire Aconfora family. Ralph Aconfora purchased the Spring Brilliance Bouquet for the family of Jill R. Samperi. I am so sorry for your loss please take comfort in the Bible's promises at Acts 24:15.